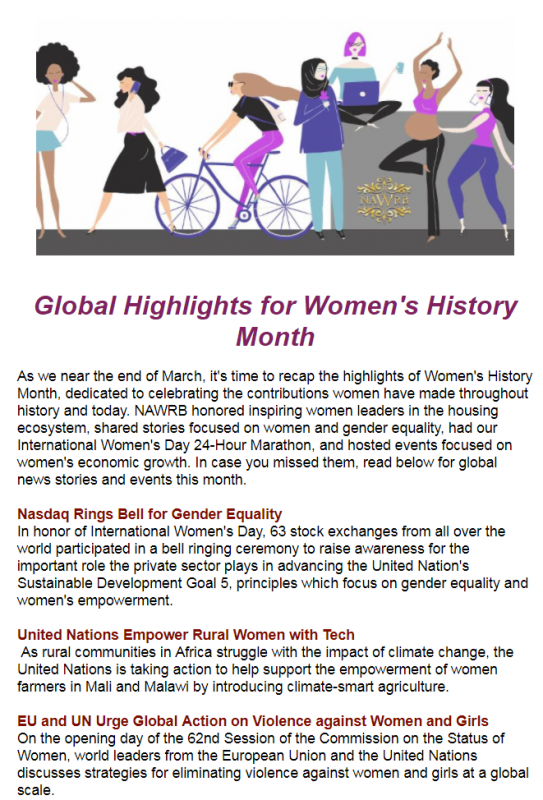 As we near the end of March, it’s time to recap the highlights of Women’s History Month, dedicated to celebrating the contributions women have made throughout history and today. 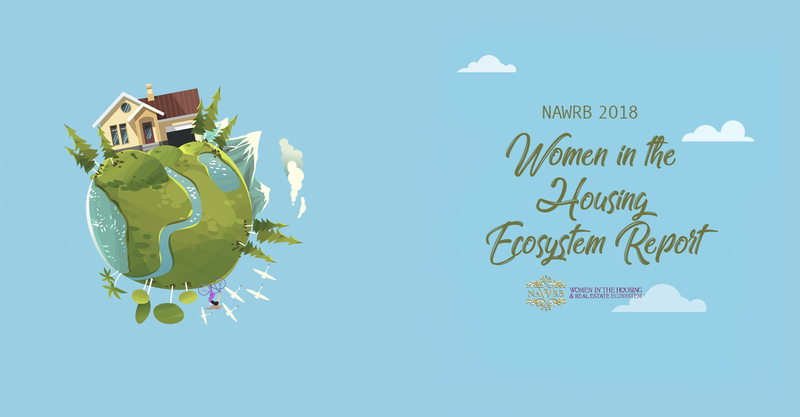 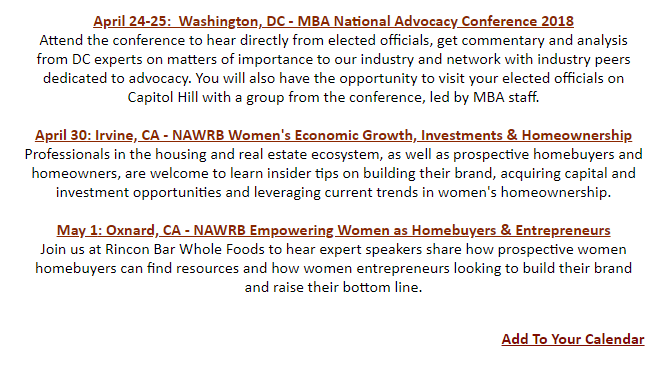 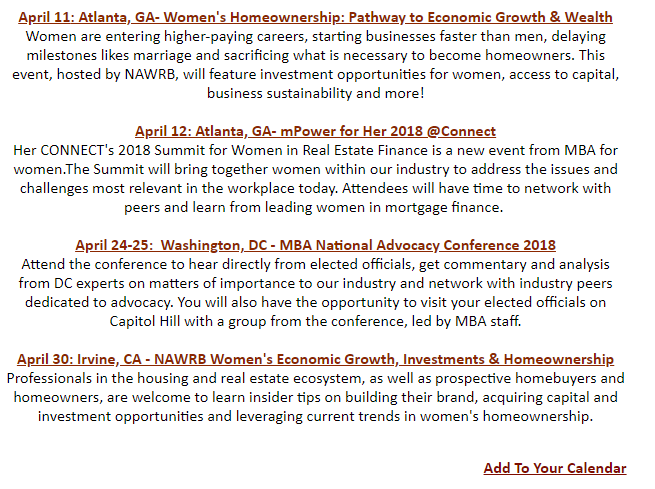 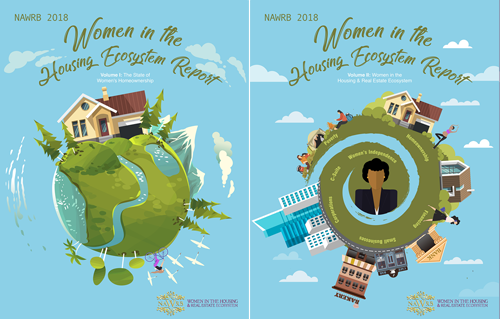 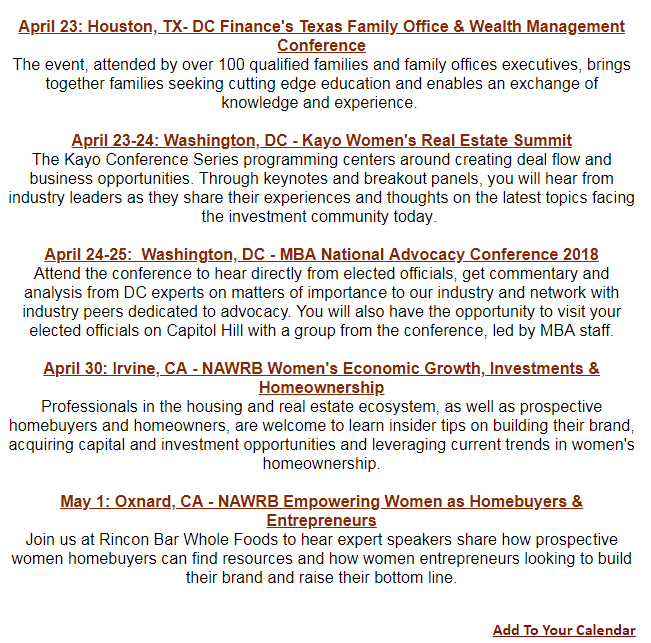 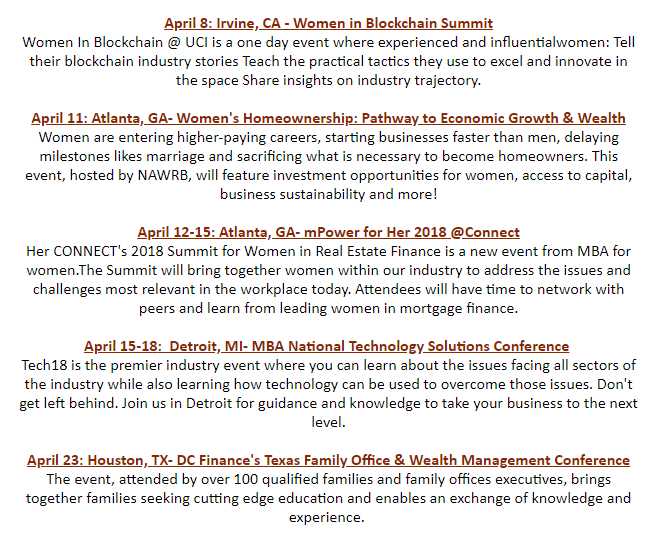 NAWRB honored inspiring women leaders in the housing ecosystem, shared stories focused on women and gender equality, had our International Women’s Day 24-Hour Marathon, and hosted events focused on women’s economic growth. 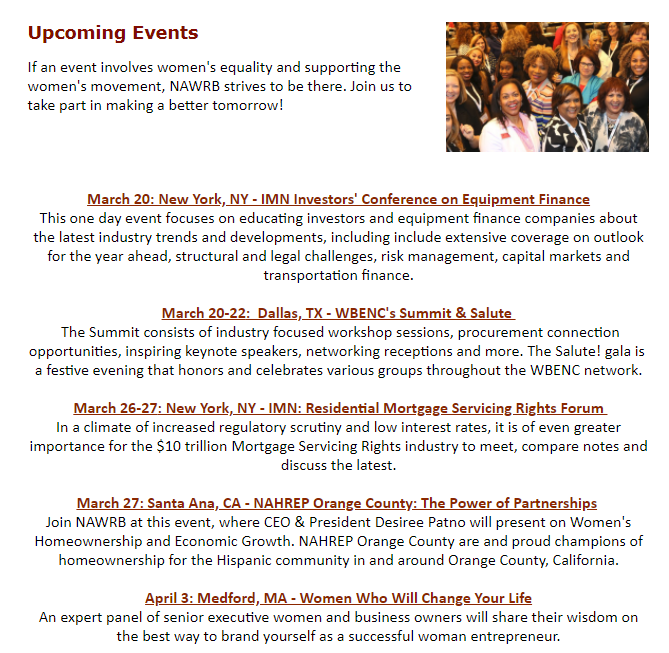 In case you missed them, read below for global news stories and events this month. 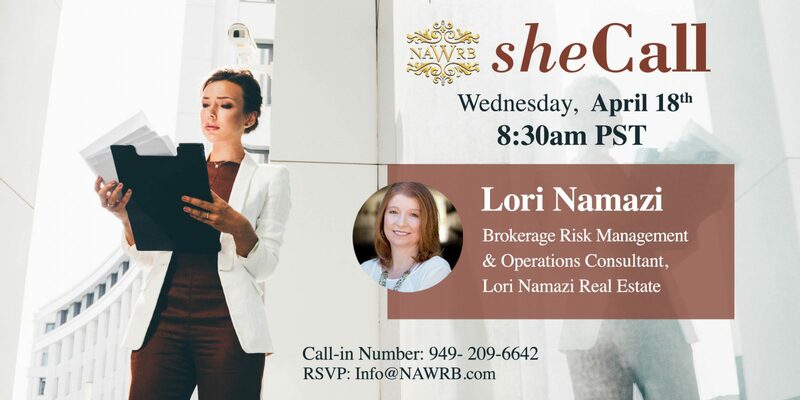 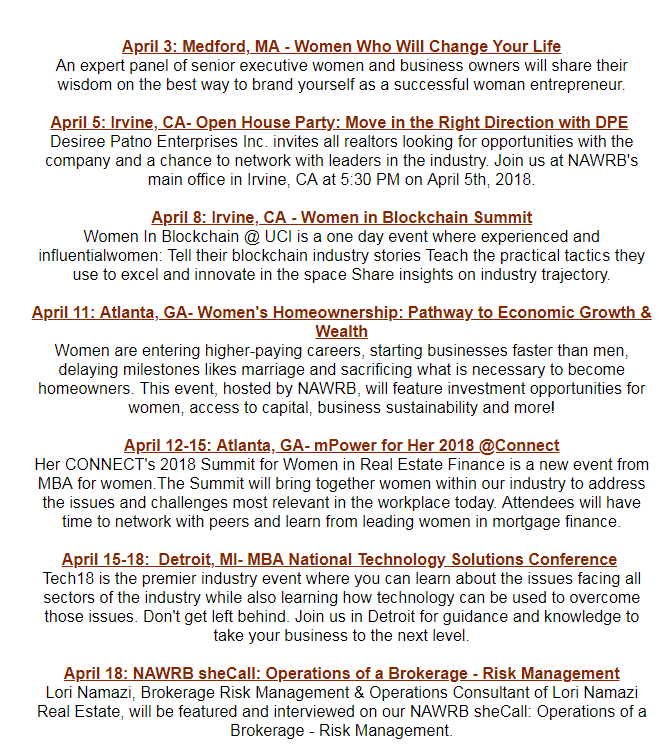 Lori Namazi, Brokerage Risk Management & Operations Consultant of Lori Namazi Real Estate, will be featured and interviewed on our NAWRB sheCall: Operations of a Brokerage—Risk Management. 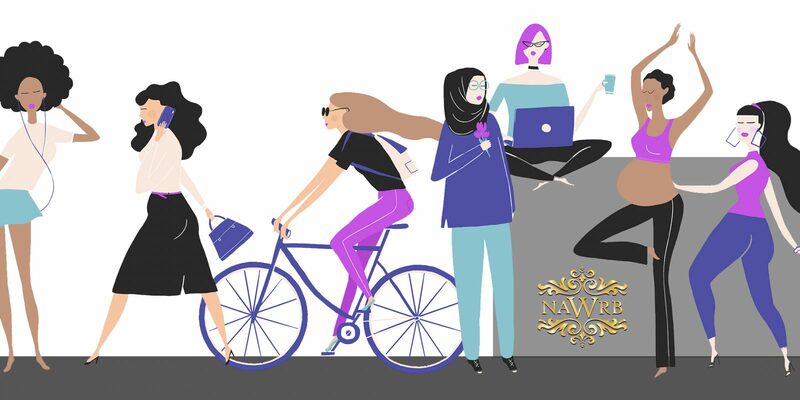 Tune in on April 18th at 8:30 AM PST to participate in our Q&A with an expert woman leader in her field. 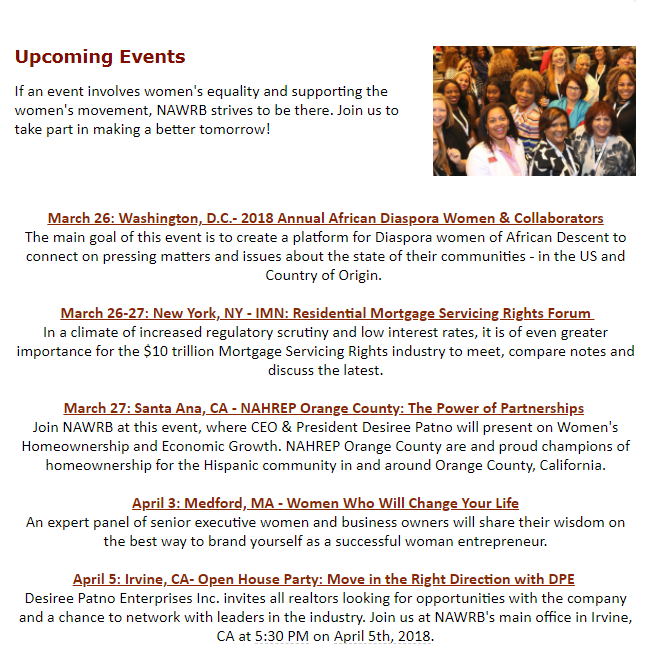 Desiree Patno, CEO & President of Desiree Patno Enterprises, Inc. and NAWRB, will join Dottie Herman, CEO of Douglas Elliman Real Estate, on her radio show Eye on Real Estate—the only show on talk radio to focus solely on real estate. 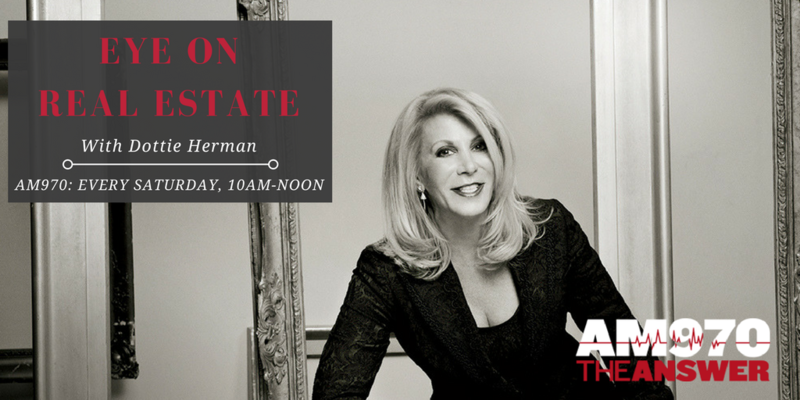 Tune in Saturday, March 24th, at 10 a.m. on AM 970 The Answer to hear Patno share her industry insight from her 20 years of experience in the housing and real estate ecosystem. 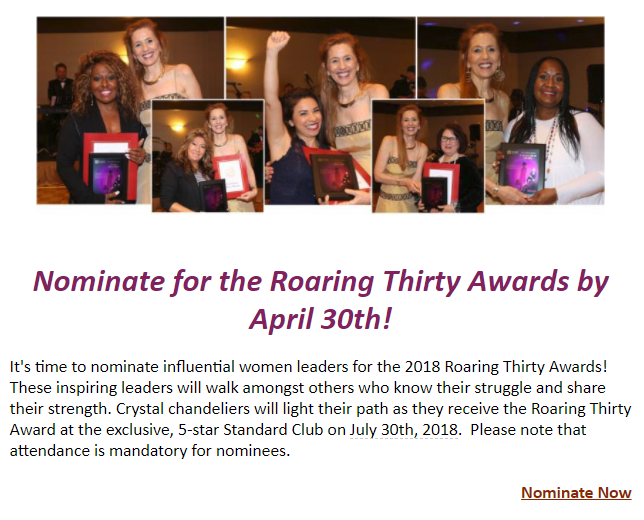 It has been 30 years since the H.R. 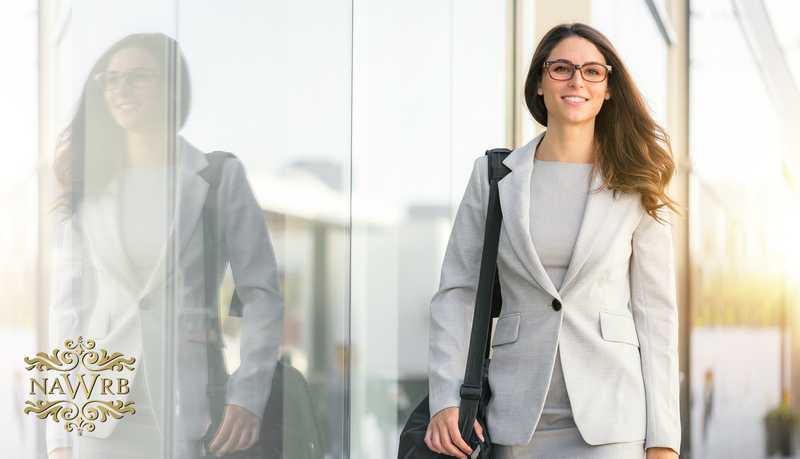 5050: Women’s Business Ownership Act was passed, which was meant to address discriminatory practices that made it difficult for women to start their own businesses. 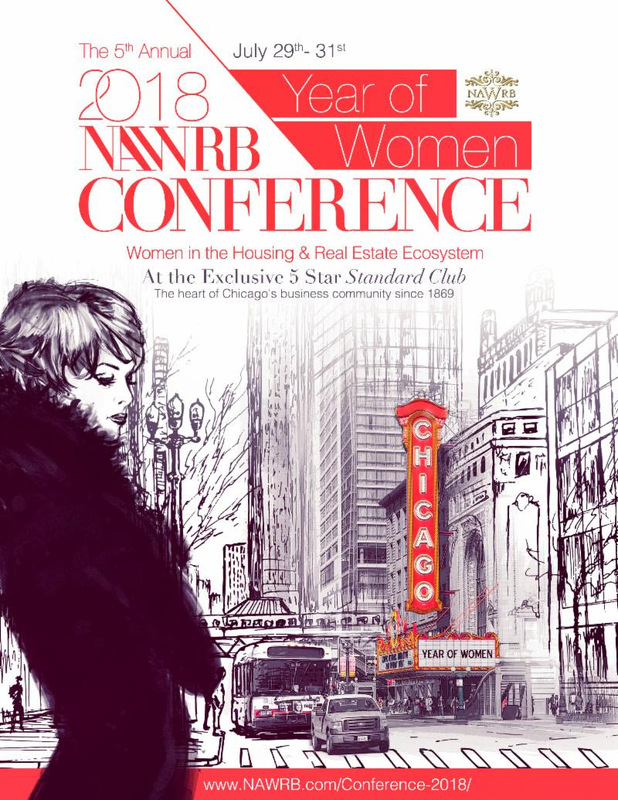 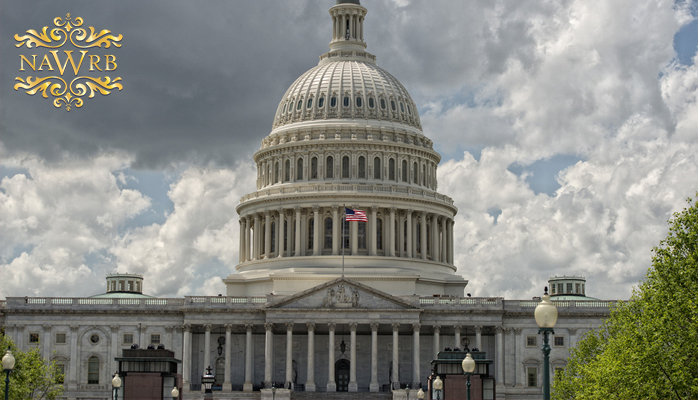 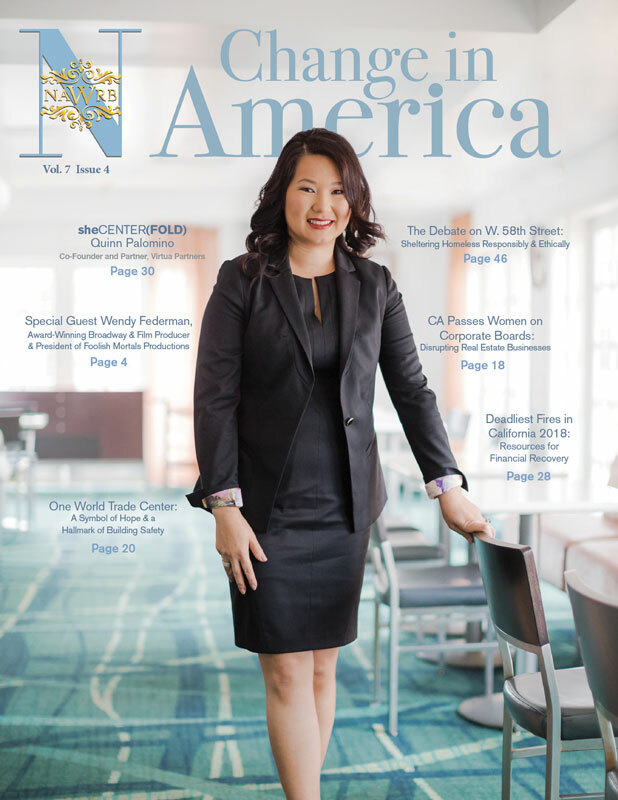 Some of its key legislative changes, such as eliminating the need for women to have a male co-signer for a business loan and creating the National Women’s Business Council (NWBC), led to an increase in the number and success of women-owned businesses. 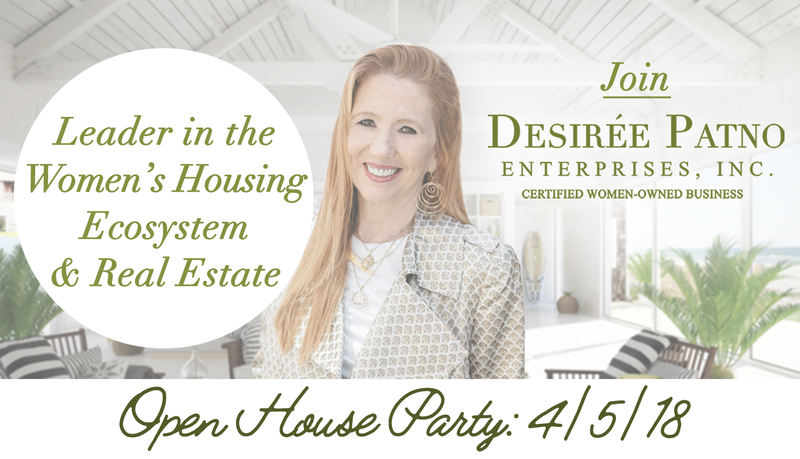 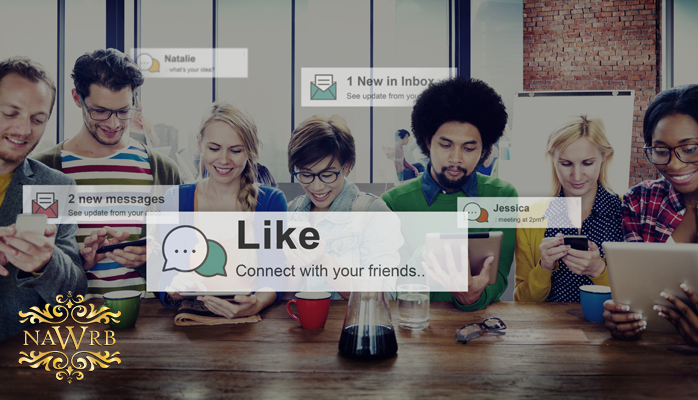 Desiree Patno, President and CEO of Desiree Patno Enterprises Inc. invites all realtors looking for opportunities with the company and a chance to network with leaders in the industry. 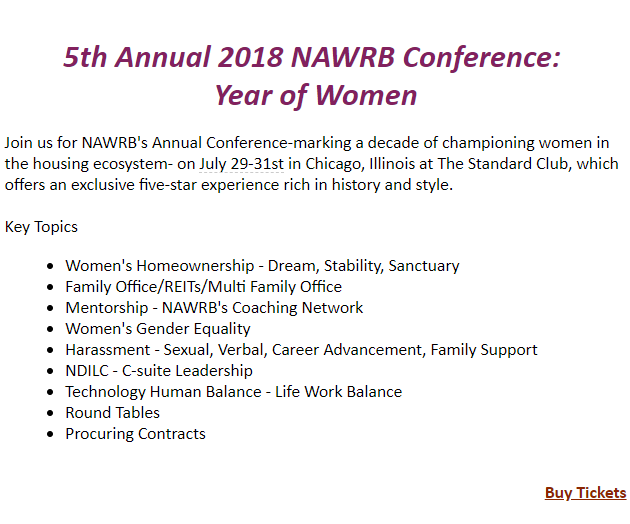 Join us at NAWRB’s main office in Irvine, CA at 5:30 PM on April 5th, 2018.